Hopefully, you've already learned how not to be a jerk while dining out. Nobody wants to be the most hated in the restaurant (and if you do, that's messed up), so here are the most important things that people need to avoid doing while they're out to eat. 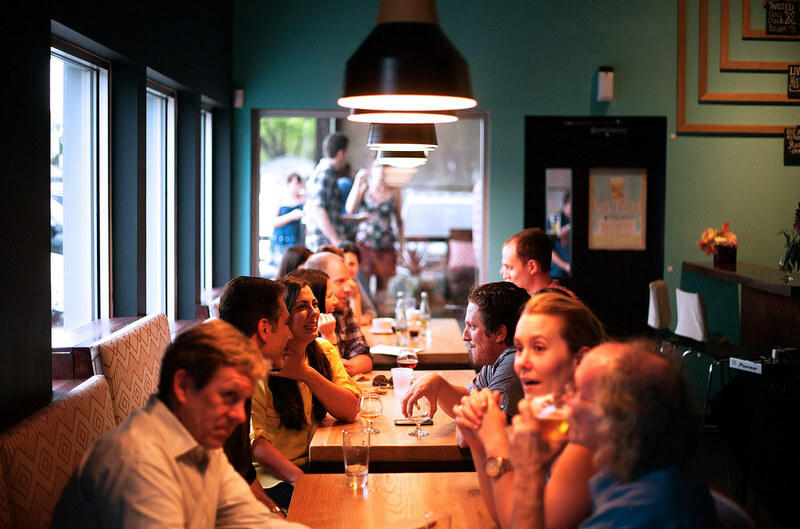 You might think these rules are obvious (because a lot of them are), but unfortunately, we've all had those encounters that make it clear that these unwritten rules actually need to be written down, so avoid these dining out no-nos and you should be golden. Reading is taught at a young age and you should be a pro by now, so read what you're ordering. If you aren't sure of an ingredient, you need to ask. Going with a mystery selection is not a reason to send it back. Don't be the ones that make things complicated. If everyone got their own meal, no sharings and such, usually splitting a check is easy when it's a small party. But it becomes a hassle when Charlotte ordered an appetizer, Zoe bought a round of drinks for everyone but Kyle, and Becca and Tom shared a dish. It's just a lot going on that you should be able to figure out for yourselves. Your server will appreciate you doing them a solid and paying the bill one way and just giving your cut to the friend who probably used their card. For some, carrying cash is a rarity, so in those cases, just Venmo or Paypal what you owe. There's really no excuse for not being able to figure out who owes what, we all have a built-in calculator in our phones that solve the problem of simple math for us. Kids are not everyone's favorite (especially when they're not their own), so a plethora of wailing children should not be on the menu. Obviously, some restaurants are more "family-friendly" than others, but that doesn't mean your little one can have full reign over the place; control that tantrum or risk everyone's judging eyes on you and the kid. If you can't control their tantrums, definitely hold off on bringing your precious offspring to more fancy, romantic restaurants where kids aren't typically frequent. It's only fair since a lot of the other diners probably got a babysitter to enjoy a quiet night out - the absence of their kids' screaming should not be filled by yours. Picky eaters, this is for you. A simple substitution is usually okay, but when you're adjusting basically the entire thing, just pick out something else. If nothing sounds good, the typical failsafe is chicken strips (according to everyone). Otherwise, if you don't like ordering from a menu stay in and make your own meal - exactly how you like it, as the chain restaurant you're currently at is not equivalent to your own personal chef. Unless you're willing to fork out the money, don't make someone else pay for your indulgences. If you're on a date, this shouldn't be a test on how much money they have and are willing to spend on you. And don't take advantage when you're out with the parents, haven't they spent enough money on you already? We're not saying you can only get a side salad and a water, just be sure that what you're ordering is reasonable, especially if a friend offered to pick up the tab. Just don't abuse their generosity - you wouldn't want your entire table ordering lobsters after you just offered to pay so you should treat them the same. We get it, you're sooo in love (barf), but save the dinner cuddles for the nights your order in. Going out to a restaurant is about the food, the environment, and the conversation. It's pretty hard to have a conversation with your neck in pain from looking sideways the entire night. If you must be touching for some weird reason, then a little hand holding over the table is more acceptable. You don't want to be the couple that Steve Carell and Tina Fey make fun of in Date Night, do you? Do us all a favor and sit across from each other like normal people. No other restaurant goer ordered chicken parm with a side of seeing you french your significant other. We're already annoyed that you're sitting next to each other and now you're just pushing it too far. If you're having trouble restraining yourselves, just think about the hot tension you'll be building up by not grossing out everyone in the restaurant; just save it for later and box that dessert up to take home. If you're in a race against the clock to order before closing time, you're doing it wrong. Nothing is worse than some entitled brats ordering right before close. You've had all day to order from there and you missed your window, so just pick someplace else that's open later. Don't force the staff to stick around just because you didn't think about what you wanted sooner. Making a reservation is not an impulsive thing, it's literally planning ahead - so be there at the time you planned! In the instances where you're running a tad late, call and give a heads up, otherwise, you have no right being mad if they give your table away thinking you're a no-show. Usually, they will be understanding because they know that things happen and they will have no problem holding off on giving your table away. When plans end up changing completely, as they often do, and you're wanting to cancel your reservation altogether, give them a call. Any explanation will work, and most won't care why you're canceling anyway. If you're a larger party, they've probably already made special arrangements and moved things around for you, so the least you can do is let them know they don't need to keep holding out for you. Getting a discount doesn't mean the server deserves less for their work, so tip on the undiscounted amount. And maybe don't be exact with the percentage if you're at a cheap restaurant, less money spent on food means you've got more to thank the server with (and make their crappy night better because they were probably stiffed from an earlier table). On the same token, you know your budget when you walk into a nice place, so don't order food and drinks to your limit leaving no money left for a tip - a tip should always be budgeted into your total meal costs. It's the ultimate snooty, aggressive move because it screams "I'm better than you, do what I say." Sorry to burst your bubble, but talking down to your server with a snap does not make you more important, and your server might even ignore you further because of it (we wouldn't blame them, either). This is without a doubt a sure-fire way to guarantee your server won't like you, so if that's your goal then be prepared to suffer the consequences. If you snap your fingers at them, you better have those fingers crossed hoping your food isn't messed with, so just don't do it - to anyone. This should be obvious. If you know someone who ended up marrying their server and lived happily ever after, just know that they are the exception to the rule. Almost every single time a customer hits on their server, it's just considered creepy. It's their job to be nice to you, that doesn't mean they're interested. If you don't know the difference between a busser and a server, you probably have never worked in a restaurant. So take note, bussers are there as more of a 'behind the scenes' helper for servers. This means that bussers handle clearing the dirty dishes, wiping down the tables, assisting the servers, etc. Servers, on the other hand, deal exclusively with the customers by taking their orders, making sure the table has everything it needs, etc. When in doubt, bussers are the ones carrying the buckets of dirty dishes asking if they can take your empty plate. A busser is NOT your second server. So no, don't go spouting out your order to the busser, or asking for a refill or anything of that matter - that's not their job. A host or hostess cannot predict the future, so when they tell you a time range just know that it's not exact. There's no way for them to know how long it'll take a party to finish and for you to be seated. They make it clear that the estimated wait time is an estimate, so getting fired up over having to wait a little longer than what they originally said will only make things worse (meaning you better chill out or they'll make sure you never get a table). If you're so peeved that you need something to do, just ask for a menu to look at while you wait and figure out what you want, that way you can get your order put in quicker. And hey, the food might even taste better since you had to wait for it and now you're starving. Bright side, my friend. Phones at the table are expected and usually not a big deal, that is, unless you make it one. Disrupting other tables with your phone is the quickest way to becoming the most annoying person in the restaurant. For example, while it's totally acceptable to take a group picture (we get it, if you don't make an update of your crew out to dinner, did you even go out to dinner? ), there is no need for everyone to have one (or 5 because your hair was AWFUL in the first four) taken on their phone. Just make it one quick picture and group message it out. Also, If your phone is blowing up, take the call outside or turn it on silent so eyes aren't constantly looking over at you in annoyance. Better yet, put the phones away and enjoy your dinner company IRL (yeah, we went there). You don't like feeling rushed by a server for faster table turnover rate but, to be fair, you shouldn't drag it on either. After you've finished your meal, it's time to pay and leave. Don't sit for three more hours catching up with your old high school buddies when it's busy; take the reunion party someplace else. Weren't you the one just complaining about the wait time? Well, now a group is waiting for you to get up. It's a simple system, so keep it moving. Nobody likes the person who lies about their meal not being "exactly" how they wanted it, or their server was "rude" just to get free food. You're not fooling anyone anyway, you're just exposing how cheap you are and it's super embarrassing and awkward for the other table members. The way society works is you pay for what you get - you're getting food, so pay for it. Another cheapskate telltale sign. You're at a restaurant, not Costco. Buying a meal does not entitle you to stock up on tons of condiments and extras just because they are there. Take a trip to the store and buy what you need instead of taking tiny versions of it from restaurants. Let's be real, group and/or tight seating is annoying, but what's even more annoying is when the stranger sitting next to you thinks they came to dinner with you. Um, no. You just happen to be dining out at the same restaurant at the same time, sitting uncomfortably close to each other. Try to make the best of it and be polite, of course, but that doesn't include becoming their new BFF. Keep to your section of the table and never, EVER jump into their conversation - a little eavesdropping is expected but your comments are not. They don't care about your opinion of the movie they just saw and are discussing with their friend, if they did, they would ask. You already learned the difference between a server and a busser, so now you need to know the difference between a server and a cook. The cook makes the food (duh), so they are more than likely at fault for your still mooing steak. There's no need to flip out on the server, they didn't tell the cook to make it that way (unless you snapped your fingers at them and that's their way of getting revenge, but that can't be it since you would never snap at them). Just simply ask to have it thrown on the grill a bit longer, no biggie.